Like most families, we have tons of stuff. From school supplies to sports equipment, there are many items that can easily be lost, misplaced or left somewhere other than home. While I would like to think that my kids are trendsetters, it appears that they like the same popular themes as all their other friends. While they might be part of the crowd, the ability to find their water bottle, hat, or bag in the sea of sameness leads to frustration. I want to easy identify my kids stuff so I'm not constantly replacing the misplaced items. That's where Lovable Labels is the solution. 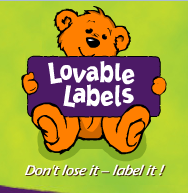 Lovable Labels is a way to label your kids items. These labels are designed in a way to stay on your kids items and keep them from the forever lost pile. Created by a mom who knows that kids items need to be durable, these labels stand up to the daily beatings of kid use. From being microwave and dishwasher safe to washing machine friendly, you can stick these labels and mark your territory. We use our Lovable Labels on water bottles. The kids have to bring a water bottle to school every day. I know that the label will stay on their bottle and keep it out of the lost and found. I can wash the bottle either by hand or the dishwasher and it won't come off. Another use in our house is pool towels. With two swimmers, we are constantly using pool towels. In the pile of towels on a gym floor, I know that my kids can quickly spot their labeled towel. No more lost towels is a great savings to me. Right now you can save $5 on Lovable Labels purchase of $25 with the code FRIENDSHIP7. This code is valid through February 28, 2013. Plus, I have a Friendship pack to giveaway to my readers. Please use the Rafflecopter to enter. Whimsical Love Story is cute! Girls pink and green with hearts -- cute, cute, cute! I like the dinosaur corner designs! I like the butterfly one! I like the majestic...thanks for the chance! I like the polka dot me design! I like the mini dots! I like the solid colors. I'd use them on my boys' uniforms. I like the love story ones, they are really fun and cute - my niece would love them!